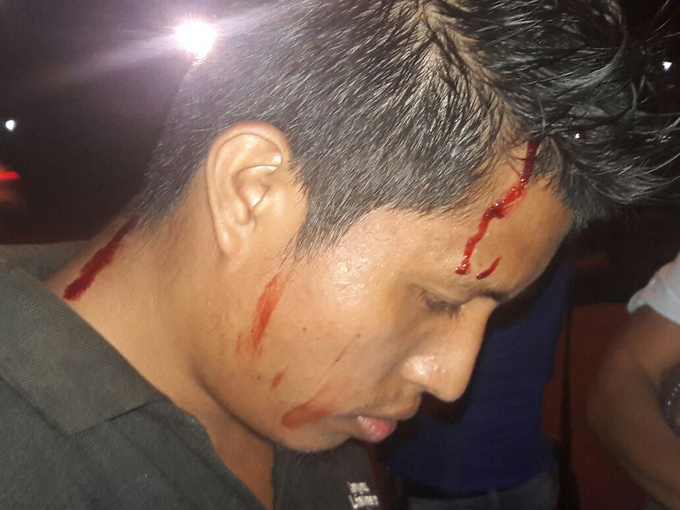 The roughest of the rough stuff that we have seen over the past several years of indigenous protests has yet to return, but at a June 7 anti-dam demonstration in Santiago this protester did get conked over the head, allegedly by a police officer. Photo by M-10. Carrera, whose popularity with her constituents was definitively destroyed by last August’s concession, called for a meeting with the government and this was held at the Catholic Church’s Centro Misionero Jesus Obrero in Tole on June 8. The government commission was led by Vice President Isabel Saint Malo de Alvarado, while Carrera led a delegation of public officials from the comarca. Carrera noted that the agreement she signed last year did not include closing the floodgates. She said that she’s not disposed to sign another agreement to retroactively allow this. She demanded that the government to stop the test before the flood waters destroy homes and an ancient petroglyph that the Mama Tatda Church, an important faith among the Ngable population, considers sacred. The government delegation flatly rejected these demands, compliance with which the indigenous side set as a precondition for further talks. The government offered to expel the dam’s promoter, a company called GENISA, from the project and find a new owner, a proposal that the indigenous side rejected. GENISA is a problem for both sides. Precisely who owns how much of it is unclear because of Panama’s corporate secrecy laws, but Hondurans who are embroiled in their country’s severe corruption scandals are among its visible faces and it is suspected that when GENISA bought the dam concession from relatives of fugitive former President Ricardo Martinelli that the sellers retained a stake in the project. Financing the dam are the German DEG bank, the Dutch FMO bank and the Central American Economic Integration Bank. GENISA and its lawyers filed fraudulent environmental statements at the project’s outset, understating the extent of the flooding, alleging that none of the comarca would be affected and certifying that there were no sites of cultural importance that would be affected. There has never been any legal consequence for these false statements, either for the company or its lawyers, but nevertheless the Varela administration would like to be rid of GENISA without getting into litigation with the banks. But the indigenous side is against the dam under whatever ownership and did not accept the government’s offer as anything of positive substance for them. With Carrera now derided as a sellout by anti-dam activists and unable to budge the government in any way that’s acceptable to her constituents, the anti-dam forces have been reorganizing for further resistance. The past protests were led by the April 10th Movement (M-10), a secular organization that identifies with the international pan-indigenous movement that’s found throughout the Americas and has many non-indigenous friends. But of rising importance has been the September 22nd Movement (M-22), which is based in the Mama Tatda Church, a faith that has traditionally remained aloof from the non-Ngabe world. M-10 and M-22 have now merged. Meanwhile riot police are in control of the area to be affected. As the floodgates closed they rounded up dozens of people, including whole families, initially holding them prisoner in a Catholic Church. Ecumenical harmony is strained in the comarca to the point where the Catholic hierarchy’s mediation may no longer be possible. The government is downplaying the religious provocation, arguing that the petroglyph will not be destroyed but will just be underwater. After six hours of impasses the talks broke off. There are no plans for further discussions between national and comarca authorities. But outside of the official sphere, the anti-dam movements are not conceding that the argument is over.